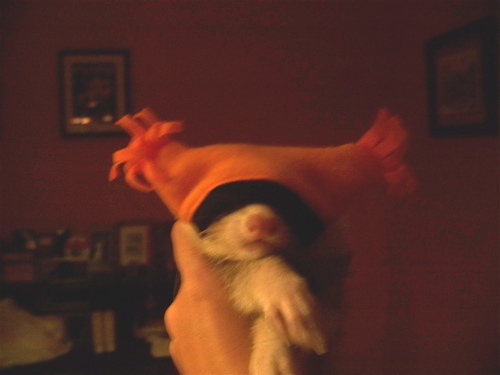 So at last weekend’s ferret show (which was epic, by the way, you should have been there) there was a raffle to benefit the shelter, and I won a little hat for the ferrets. 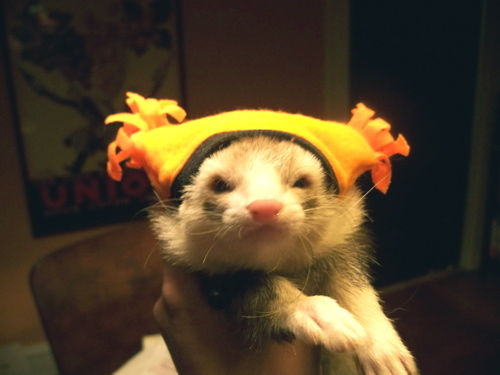 A tiny, orange, tasselled, fleece, stoner snowboarding hat. For the ferrets. 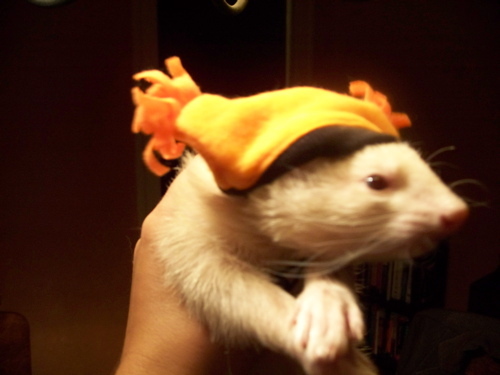 And because I am becoming That Ferret Lady anyway, and because I know the Internet the way I do, I knew you would have to see them try it on. Bucky: That’s a cool story, bro. Seriously, they had it on for all of three seconds. Then they were given treats in a futile attempt to keep them from thoughts of revenge. I think it worked. I mean, I haven’t checked my shoes yet. You’ve stapled hats to them again! This is the best thing I’ve seen on the Internets in like 30 seconds! i do not abuse my cats in this way. I want that picture of Riot to be the wallpaper on my iPhone. Can they climb? Best be putting your shoes up high. Man, Riot wins for best picture on the internets today. Watch–Michael Steele will be on the phone trying to buy it to trick out the GOP website.